Simone Veil has spoken on very different stages and subjects, and before extremely diverse audiences. 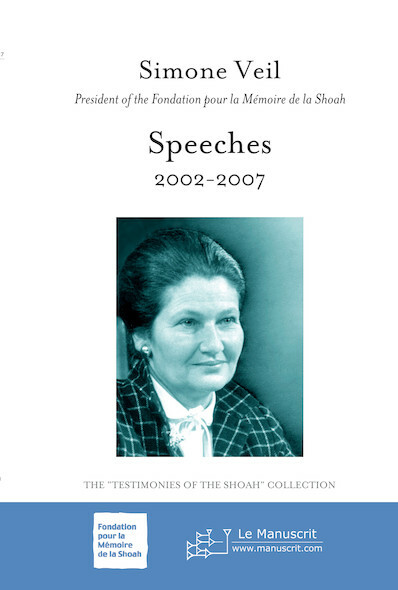 The speeches collected here represent only a fraction of her public dialogues: those given over the last six years in her capacity as president of the Fondation pour la Mémoire de la Shoah. Having written those last words, I must immediately correct myself: when our president discusses the Shoah, she is firstly and always Madame Veil, the Auschwitz survivor, matured and enriched by her French and international political experience, who speaks from the heart about her own memory and her own thoughts. Alone, the typed pages of these speeches doubtless lack her gaze, her gravitas, and the singular tone of her stories, which always pierce her listeners.